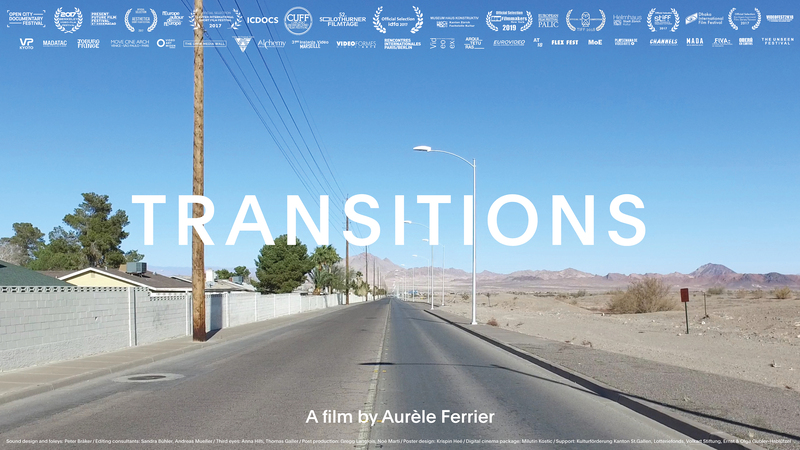 The work Transitions (2017) by Aurèle Ferrier examines the traces left by human civilisation - the conquest of the unwelcoming hostility of the desert ends in the surreal and hedonistic consumerism of Las Vegas. The camera leads us, with a menacing langour, through a backdrop of deserted city-outskirts. The buildings, cars and billboards speak of people’s dreams as they strive for a version happiness. The prevailingly eerie, apocalyptic mood draws you along on this filmic journey. These traces of humanity seem increasingly laughable and helpless, they vibrate with a peculiar melancholy. Where have the people disappeared to? One has the impression a catastrophe has occurred, an epidemic, or maybe it is simply an empty film set after a shoot? The film with its calm and assured grasp on image and sound is able to produce a refined suspense. The film takes the viewer on an odyssey, one that could also be a metaphor for the boundaries of human endeavor. The human culture and civilisation that emerged from the desert, will in the end be desert again.